Is your child struggling to learn her times tables? Maybe she resists timed worksheets, gets bored with skip counting and absolutely detests oral drill? 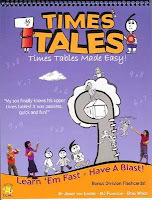 Trigger Memory Systems has developed Times Tales, a mnemonic system for learning the times tables. The system combines a flip chart with black and white picture story cards and a teacher's manual which includes full instructions, tests, and flashcards. As a member of the TOS Homschool Crew, I was given the opportunity to try out the system with my kiddos and give you my thoughts on it. Mnemonic aids work by connecting the fact you want to remember with an unusual story that produces a vivid image in your mind. With Times Tales, you start by introducing your student to the symbols used to represent the numbers to be multiplied. 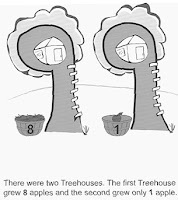 Examples: the number 8 is represented by "Mrs. Snowman," the number 9 is represented by a treehouse (see the picture below), and "Mrs. Week" represents the number 7. The next step is to introduce the first set of stories with the picture flip chart and go over them to the point where your child can tell you the story while looking at the picture with no caption. It's only at this point that you actually let on that these are multiplication problems when you show your child the special picture flashcards that show the multiplication problem using the same symbols to represent the multiplied numbers. The child then states the problem aloud, replacing the real numbers for the symbols, and gives the answer. Trigger Memory claims that your child can learn the times tables in an hour...I was more than a little sceptical, especially given my personal experience with mnemonics devices, but imagine my shock when 8-year-old David was immediately able to tell me the answers to the flashcards! David did already understand the concepts of multiplication and division, but he did not yet know any of his times tables beyond "2x." It seemed like a miracle. So we continued with it. The next step was to switch to the flip side of the flashcards which are just the numbers. Hmmm, he did okay with that, a little slower perhaps, but there was also the fact that he was attempting to read the picture problems through the cards (note: while the paper is thick, you can see through it, so make sure you don't hold them up to the light. My child has no problem "reading" the pictures backwards and upside down through paper). So the next day we tried the "practice test" which presents the problems in picture form and he raced through it. The next day we orally reviewed the stories and then I gave him the "test" which presents only the numbers of the problems. He could not do it. No problem, obviously this is just not the hour miracle they claim, which I did not really expect anyway. So we proceeded to do the number flashcards (no pictures) for the next 2 weeks. Keep in mind this was only Part I of the program, which presents the 3's and 4's facts for 6 to 9 (only 8 facts---the whole set covers a total of 18 facts). By the end of those 2 weeks, David still only really knew about half of the 3's and 4's facts. For the others, he was still screwing up his eyes, remembering the story and then getting the number answer from that. We've put aside Times Tales for now, perhaps we will come back to it in the Spring as a supplement to regular drills. It is a fun program for the kiddos, even Mary was doing pretty well learning the stories, but the mnemonic approach doesn't seem to work very well as a stand alone for this family. I envision incorporating this as one activity of many to reinforce the times facts. Maybe when your child has had it with drills this could be a breath of fresh air and for a child who's is having particular difficulty mastering the times tables, sometimes all that is required is a slightly differently approach to "get it." Times Tales Deluxe is available from Trigger Memory Systems for $29.95. It is also available from the Old Schoolhouse Store. Also from Trigger Memory Systems: Clean 'n' Flip Charts. Maybe my house isn't the only one out that there has become a black hole for losing stuff? Or maybe Mom could use some help with the actual cleaning? Trigger has put together 3 flip charts for the kiddos, available either as a set or individually: Bedroom Cleaning for Kids, Zone Cleaning for Kids, and Laundry for Kids. The Laundry and Bedroom Cleaning charts are printed on heavy, colorful paper and give step by step instructions for completing the task. Each page is one step complete with pictures even younger children can follow. Complete a step, then flip the page for the next step. Each of these is available for $7.95 from Trigger. The Zone Cleaning chart is a little different. It's laminated and comes with a dry-erase marker. The chart divides the house into zones (kitchen, bathroom and living room) and gives you places for assigning particular zones to particular kiddos. Like the other charts, there are step-by-step instructions complete with pictures, but there's also little boxes for checking off the jobs and slots for filling in times completed. The Zone Cleaning Chart is available for $17.95 from Trigger. Or get the the complete 3 chart set for $29.95. The flip charts are also available from The Old Schoolhouse Store.